Belinda & Sam | Love It or List It Galleries | Merit Kitchens Ltd.
Belinda & Sam’s 100-year-old character home was in need of a major renovation. In addition to creating a mud room for the kid’s hockey gear, the family wanted to redo the Master Bath and ensuite. Opening up the main floor of the house to accommodate the growing family was also on the homeowner’s list of requirements. The cabinets from Merit Kitchens added a contemporary feel to the kitchen. 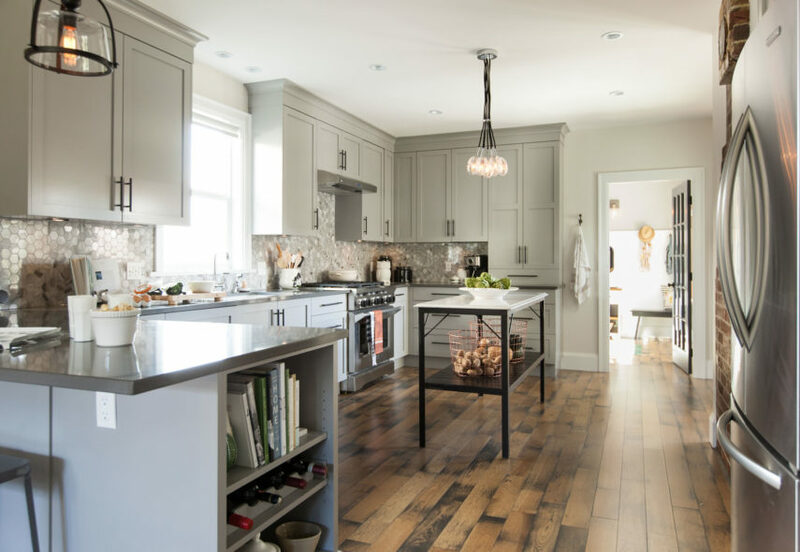 The aim of the kitchen design was to keep everything rustic to match the original style of the character home. The subtle grey selected for the kitchen cabinets created a bright and open feeling. Additional Details: The kitchen features ample storage and an eating bar that doubles as a serving area when entertaining, space for schoolwork or mom and dad’s paperwork.